Will Obama express US lingering pain& ask Muslims for tolerance by discouraging 9/11 mosque while he celebrates Islamic holy month tonight? WASHINGTON — President Barack Obama on Friday forcefully endorsed building a mosque near ground zero, saying the country’s founding principles demanded no less. Read the full transcript of his speech here. People are also asking other tough questions, like what is the deal with this imam? Where is the money coming from? Why won’t he condemn hamas as a terrorist organization? We’d better ask these questions. Our security depends on it. Why isn’t our President asking them? So President Obama, who turned his back on any public celebration of the National Day of Prayer his first year in office, decided to announce his support of the mosque as he celebrates Islamic Holy Month tonight at the White House. Interesting. 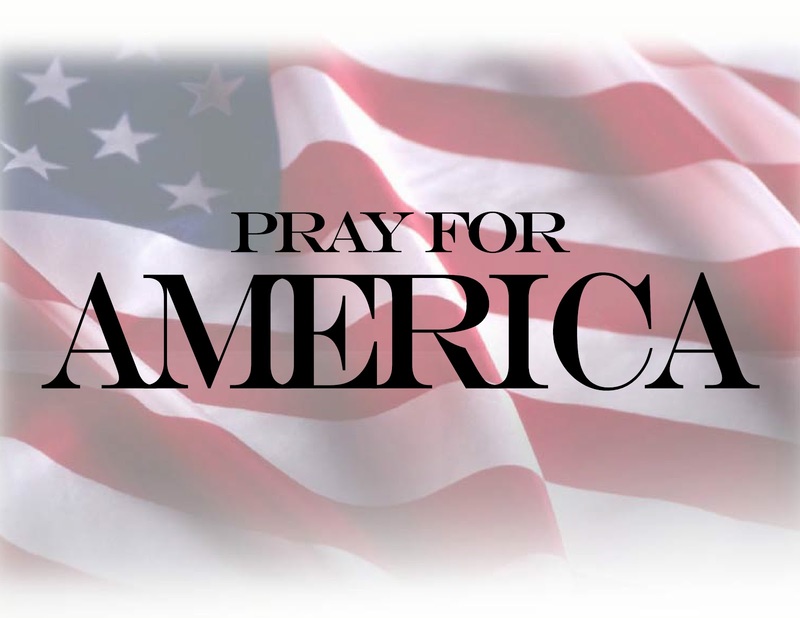 I respect the diversity of America, the freedom people have to worship as they see fit. What I have a problem with, however, is the failure of the President of the United States to comprehend how the victims’ families, New Yorkers, and each American citizen deserve to be heard, our pain respected, and common decency to prevail. But once again, he appears to be completely disconnected from the people he’s been hired to serve. Perhaps he’ll reconsider his position as he heads out to yet another vacation. Well, Governor Palin, you asked. 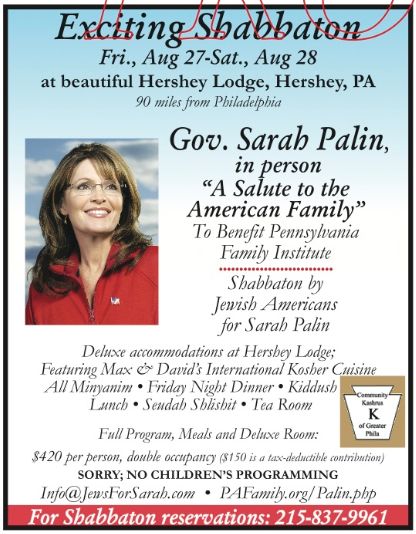 Jewish Americans for Sarah Palin have announced a kosher shabbaton (sabbath retreat) in conjunction with the Pennsylvania Family Institute’s “Salute to the American Family” on August 27. Governor Palin will be giving the keynote address at that event. The shabbaton will include a gourmet meal and Shabbat at the Hershey Lodge. Governor Sarah Palin will be speaking at the renowned Hershey Lodge, Friday evening, August 27, 2010, in a benefit appearance for the Pennsylvania Family Institute. The PFI has graciously allowed Jewish Americans for Sarah Palin to offer a kosher shabbaton for the evening, plus a relaxing sabbath day at the Lodge, replete with all Jewish prayer services and gourmet kosher meals. and two hours by car from North Jersey. All meals will be catered by Max & David’s International Kosher Cuisine under the strict rabbinical supervision of Keystone-K, Community Kashrus of Greater Philadelphia. More details are available here on the JewsforSarah website. To stop Nancy Pelosi and her liberal agenda, we must defeat career politician U.S. Rep. Michael McMahon. It’s time to end the bailouts, the so-called “stimulus”, the government take-over of health care, and the massive new energy tax called “Cap and Trade”. That’s why Republicans like Rudy Giuliani, John McCain and Sarah Palin are lining up behind my campaign to replace him. The Republican Primary is around the corner and I need your support. Giuliani, McCain and Palin know that as a Marine Combat Veteran, former FBI Special Agent and small businessman, I’ll stand up to Nancy Pelosi’s liberal agenda. I’ll fight for Smaller Government, Lower Taxes, Stopping the out of control Spending, reducing the Deficit, and a Strong Military. Career politician Michael McMahon supported the bailouts and stimulus programs. He also refuses to fight for the repeal of the Obama Health Care takeover. Worst of all, McMahon supports Obama’s “Cap and Trade” scheme that will raise your energy bills in order to meet the demands of the environmental extremists. Even more surprising, my Republican Primary opponent also supports Obama’s “Cap and Trade” scheme. That’s why we need now more than ever a true, strong Conservative who will fight for freedom and individual liberty! today. Even $25, $75 or $150 would make a big difference. It’s more important than ever that Conservatives band together and unite behind the right candidates. I promise you won’t regret your support. I’ll represent the PEOPLE, not the POLITICIANS.